With the addition of the Bedford Singletrack this year, the Royalview Trail in 2012, OECR mountain bike trail a few years ago, and more on the way, the Cleveland Metroparks is expanding mountain biking opportunities in Northeast Ohio. 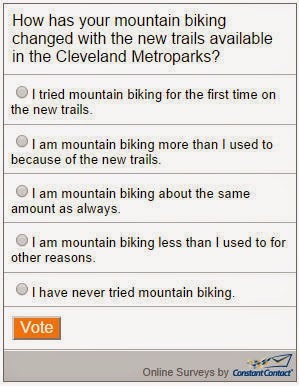 Our last online poll asked, "How do you feel about electric bicycles?" The majority of responses (52%) said "I would be curious to try one," while 32% said "No way, not ever; bikes should only be human-powered." You can see the full results of the last poll here.